BEARING RETAINING COMPOUND - LOW VISCOSITY - GREEN - General purpose high strength compound for retaining bearings, bushings, collars, keys and splines. Gap filling capability to .005" allows for use of slip fits instead of press fits. Meets MIL-R-46082B TYPE I. BEARING RETAINING COMPOUND - HIGH VISCOSITY - GREEN - High temperature, high strength compound for retaining bearings, bushings, collars and gears. Gap filling capability to .015". Resists temperatures up to 450ÂºF (232ÂºC). Meets MIL-R-46082B TYPE II. 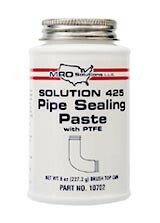 PIPE SEALANT WITH TEFLON - Low strength, non-migrating paste seals instantly. Forms seal for fluid and gas pressurized pipe fittings. Intended for use on tapered threads. May be disassembled with hand tools. Temperature resistant to 400ÂºF and rated to 10,000psi. 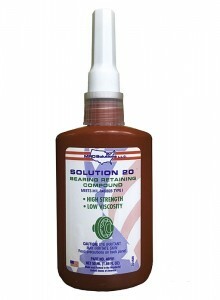 HYDRAULIC/PNEUMATIC SEALANT - Low strength compound for sealing hydraulic and pneumatic systems. Compatible with gases, hydraulic fluids, oils, and solvents. Prevents vibrations, high viscosity "No Drip". Works on all metal fittings. Click here to view the Technical Data Sheet for Solution 40. Flexible Flange Sealant is a high performance anaerobic gasketing sealant for most metals including aluminum. Specifically formulated to resist oil and solvents and remain flexible after curing, allowing the seal to "flex with flanges." 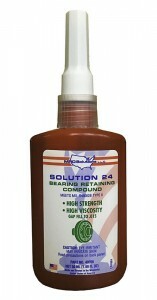 Solution 40 cures without shrinkage in the joint, creating an insoluble, resilient, vibration-proof seal that will not leak even if flanges are chipped or damaged. 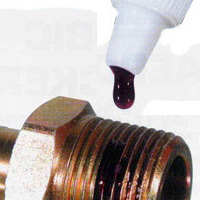 Provides a gap fill of .010" (.050" with primer) and has a temperature range of -65Âº to 300ÂºF. PIPE SEALING PASTE is a Premium, TeflonÂ® enhanced compound which provides superior sealing for most threaded metal or plastic pipe. SOLUTION 425 will prevent leaks and seal most common fluids and gases, including fuels, oils, water, refrigerants, steam, and inert gases. Non-hardening formula will not crack, shred, or contaminate most systems. Eases assembly and disassembly of metal and plastic fittings. Seals to bursting pressure of pipe and is rated to 10,000psi Not recommended for potable water systems or for use in oxygen service. Product safe for incidental food contact. Packaged in easy to use brush top cans. TeflonÂ® Registered trademark of DuPont.